Claire Taylor (Co-editor), Kostas Vlassopoulos (Co-editor). 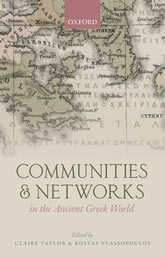 Communities and Networks in the Ancient Greek World. Oxford: Oxford University Press, 2015. This volume examines the diversity of networks and communities in the classical and early Hellenistic Greek world, with particular emphasis on those which took shape within and around Athens. In doing so it highlights not only the processes that created, modified, and dissolved these communities, but shines a light on the interactions through which individuals with different statuses, identities, levels of wealth, and connectivity participated in ancient society. By drawing on two distinct conceptual approaches, that of network studies and that of community formation, Communities and Networks in the Ancient Greek World showcases a variety of approaches which fall under the umbrella of ‘network thinking’ in order to move the study of ancient Greek history beyond structuralist polarities and functionalist explanations. The aim is to reconceptualize the polis not simply as a citizen club, but as one inter-linked community amongst many. This allows subaltern groups to be seen not just as passive objects of exclusion and exploitation but active historical agents, emphasizes the processes of interaction as well as the institutions created through them, and reveals the interpenetration between public institutions and private networks which integrated different communities within the borders of a polis and connected them with the wider world.